Yale University Press, New Haven and London. 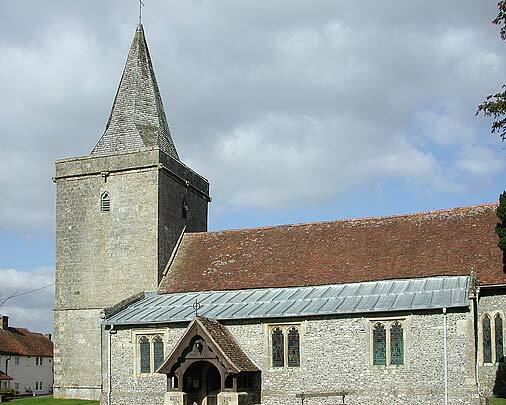 The W tower is of stone and Decorated (early 14th century); yet it is still unbuttressed. 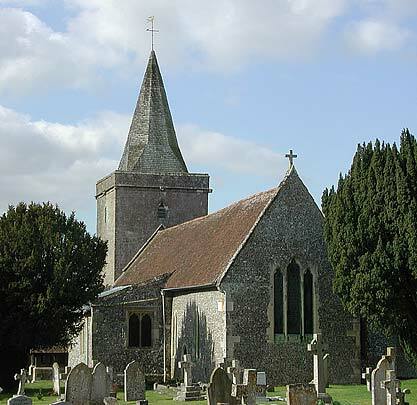 The rest of the church is of flint. ... A few Norman fragments built into the tower. Internally there is much more interest. 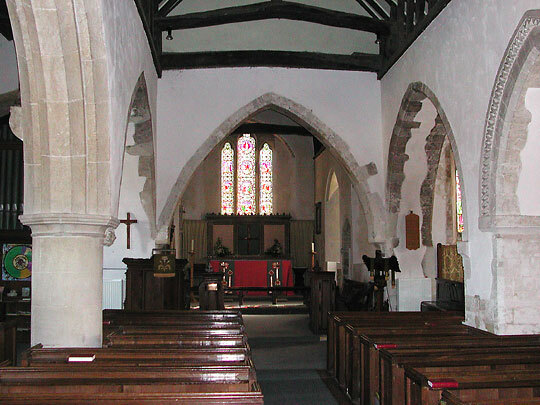 View from nave into chancel. 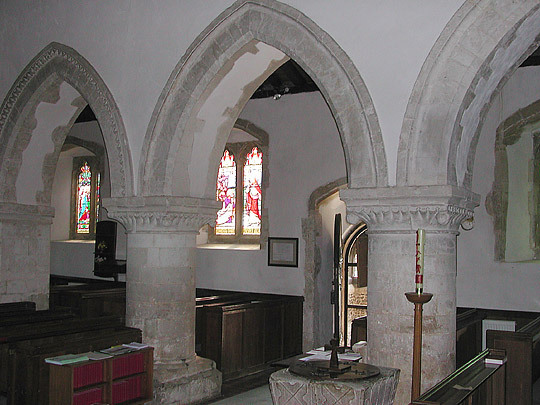 The chancel arch and former transept arches either side date from the late 1100s. In the next picture the south arcade, showing the three western-most arches. The fourth, easternmost, is visible in the first picture. The arcades are of four bays, but they are by no means a homogeneous job. First come the two W bays of the S side. Round pier, square abacus, trumpet-scallop capitals with some decoration. ... 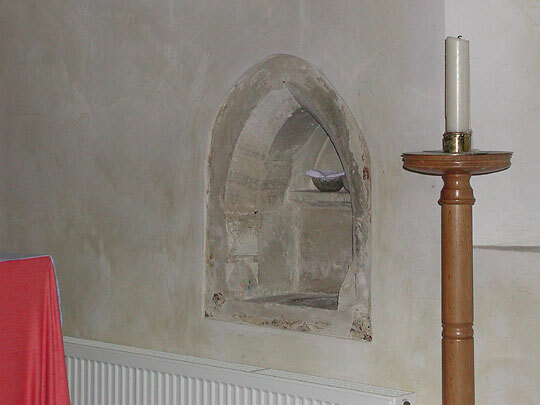 Pointed arches with one slight chamfer. That indicates c.1190. At the same time or perhaps a few years before, the transept arch, i.e. evidence of a cruciform church ... Then, early C13, the third S arch, connecting arcade and transept. This has a hood-mould of dogtooth. Only after that the N arcade ... 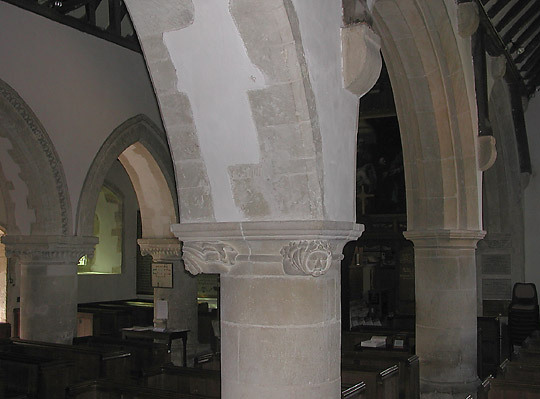 Round piers, octagonal abaci, arches with one chamfer and one hollow chamfer ... good figural decoration of the early C14. All photographic images in pages within the domains astoft.co.uk & astoft.com are © Copyright the Website owner 2001 or later unless otherwise stated. Email contact above. Full size 3megapixel originals are available for approved purposes.